Garg was honored for his contributions to the study of nuclear matter, particularly for the study of nuclear incompressibility, and quantal rotation. He is one of 396 scientists named as AAAS Fellows this year, and will be recognized Feb. 17, 2018 during the association’s annual meeting in Austin, Texas. “I am honored that my peers have chosen to recognize me for our work, and wish to especially acknowledge my students, postdocs, and collaborators from around the world who have contributed much to its success,” he said. Garg and his group study a kind of vibration of the nucleus, called the “breathing mode,” in which the nucleus expands and contracts. The energy associated with such vibrations is directly related to nuclear incompressibility—how far a nucleus can be squeezed. This is an important component characterizing the equation of state (EoS) of nuclear matter, and is crucial for the study of diverse phenomena in nuclear physics and astrophysics, including the understanding of the first observation of the merger of two new neutron stars in August 2017. Additionally, his group investigates exotic quantal rotation, especially phenomena associated with rotation of atomic nuclei that have the shape of an ellipsoid with three unequal axes. These look similar to an Idaho potato, and exhibit unique properties such as wobbling, like the motion of a top that’s not quite symmetrical. They also exhibit chirality, or “handedness.” Garg and his group perform their measurements at experimental facilities in the United States and around the world, including France, India, and Japan. Garg joined the University in 1982 as an assistant professor of physics, and has been a professor since 1994. He earned his bachelor and master of science degrees from Birla Institute of Technology, Pilani, India, and his doctorate in physics from the State University of New York at Stony Brook. He has been a Fellow of the American Physical Society since 1999, received a Kaneb Award for Excellence in teaching, and was the recipient of the inaugural Terrence Akai Award for service to international students. 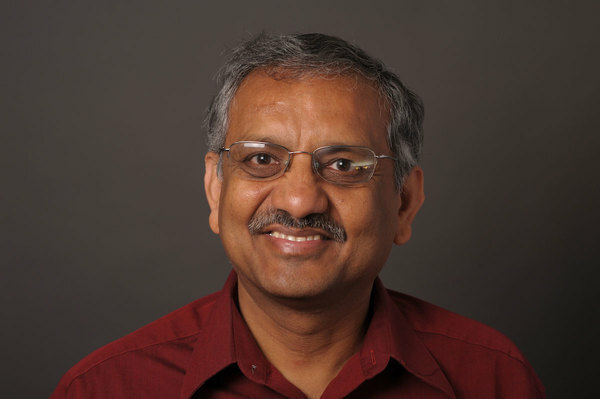 In 2015, Garg was honored with a Fulbright Specialist Award. In addition to Garg, Kenneth T. Christensen, professor and collegiate chair in fluid mechanics, and chair of the Department of Aerospace and Mechanical Engineering, has also been named an AAAS Fellow. Originally published by Deanna Csomo McCool at science.nd.edu on November 20, 2017.